Click image of hospital at Camp Letterman 1.25 miles east of Gettysburg to learn more about where wounded Parham was taken. I take it on myself at Parhams request to write to you and let you know how Parham is getting along with his wounded leg as I expect you will hear he is wounded before this He does not suffer much with his wound although it is a very severe one. The ball entered just above the right knee and passed directly through. I expect it will be amputated. Tell Mrs Luckie not to be uneasy about him as Newt Shaw and and myself are both with him he is in as good spirits as any body. I would give a list of the killed and wounded but there are a great many missing who we don’t know whether they are killed or Prisoners. It was the most Horrible fight of the war. Our regiment in with 425 and came out with 65 we suffered I believe more than any other in the division. 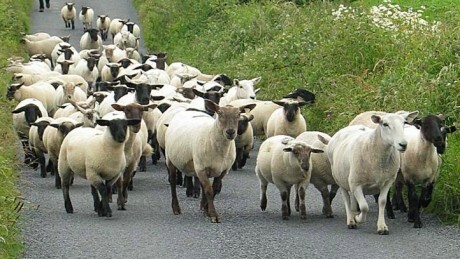 Our troops are still in very good spirits although we driven back. Parham will write in a day or two J.F. With respect to Parham’s wound, the ball entered just above the right knee and passed directly through. This may suggest Parham reached within Federal musket range during Pickett’s Charge somewhere between the vicinity of Emmitsburg Road and the stone wall near Brian’s Barn. See previous post on Pickett’s Charge. A History of Company G, Eleventh Mississippi Regiment, C.S.A. documents information about persons listed by name in this letter. Click image of Pacolet (Jack) Fernandez to view source. 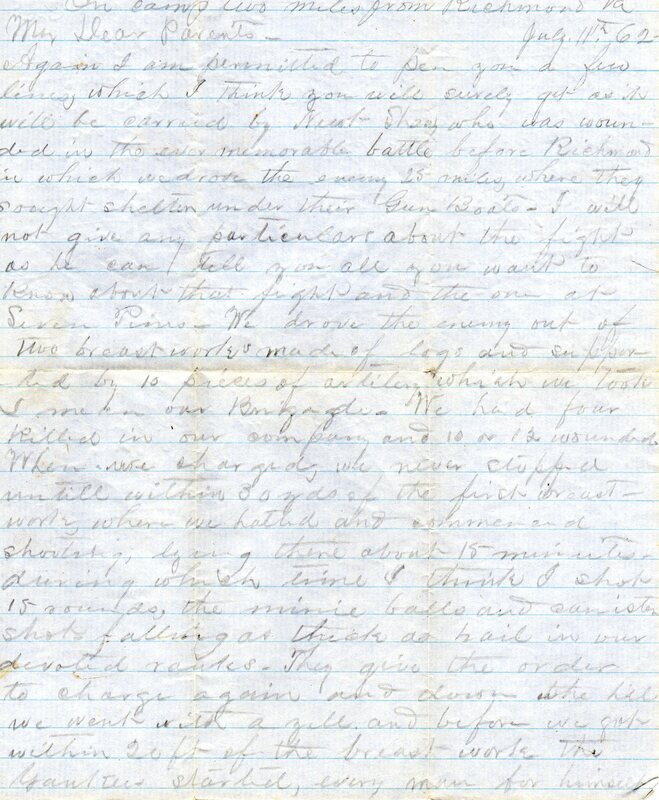 Pacolet (Jack) Fernandez, writer of this letter per Parham’s request, enlisted May 23, 1863, at Oxford, Miss., for one year. Born in South Carolina, and a student at College Hill, Miss. ; seventeen years of age and single. He was present and took part in the battles of Freeman’s Ford, Thoroughfare Gap, and Second Manassas, two days at Gettysburg; Falling Waters, Bristol Station. In the engagements of August 22, 28, 29, and 30, 1862, he acted as an independent soldier. After the battle at Bristol Station he was on detailed duty, I think as a courier. Parham previously wrote of Jack’s family on January 17, 1863, stating that he learned Union forces occupied College Hill and burned the Fernandez house. William N. (Newt) Shaw, who was granted permission to stay behind with Parham at the hospital, enlisted August 9, 1861, at Bristol Station, Va., for one year. Born in Mississippi; a farmer near College Hill, Miss. ; twenty-three years old and single. He was present at Seven Pines, two days; Gaines’s Farm, and was absent wounded until he was present second day at Sharpsburg, Gettysburg, two days; Falling Waters, Bristol Station, Wilderness, two days; Tolles Mill, Spotsylvania, Hanover Junction, Bethsaida Church, two days; then Weldon Railroad where he was killed on first day. Promoted to Corporal, November, 1864…Of the four (Shaw) brothers only one survived the war, and he was shot through the left lung. How dear was the cause that required such costly sacrifices! Is there any wonder that the memory of it should still be dear to every Southron? Whilst time lasts may this memory be cherished. The name “Fernandez” is noteworthy as it reveals the service of persons with Hispanic heritage in the town of College Hill, the state of Mississippi, and the Confederacy. Many Hispanic Confederates came from well established and prominent families; some traced their ancestry to explorers who settled in North America generations ahead of the English according to National Park Service article Hispanics and the Civil War. College Hill Presbyterian Church Cemetery list of buried reveals the Fernandez family was one of the early settlers in the community. A total of 18 persons bearing the name are buried there, including the writer of this letter. Pacolet was not the only Fernandez from the community who volunteered with the Lamar Rifles; Henry Gore also bore the name. Both Pacolet and Henry Gore Fernandez are listed by John O’Donnell-Rosales in a 90 page directory of Hispanic Confederates. Click image of Parham’s church in College Hill, Mississippi to learn about his home community behind Yankee lines. Click image to watch Vicksburg Animated Map by American Battlefield Trust. Click image of CSA Lt. Gen. John C. Pemberton to learn about his defeat. Parham’s sister in College Hill, Mississippi was behind Yankee lines, and Parham previously wrote on January 17, 1863 of learning about the burning of a home within the community by occupying forces. Assuming family food provisions had been taken by the enemy, he also mentioned sending money home in the same letter and again on March 18, 1863. Parham wrote of two individuals in this letter. John C. Pemberton (CSA Lt. Gen.) is stated to have been whipped, showing how quickly, just seven days, news of the disastrous blow to the Confederacy at the Battle of Champion’s Hill traveled from the Mississippi River to the 11th Mississippi located in Southeast Virginia. Joseph E. Johnston (CSA Gen.) had been mentioned before by Parham (November 23, 1861 and January 21, 1862) as he was the original commander of the Army of Northern Virginia and replaced by Robert E. Lee when wounded at Seven Pines. Upon recovering from his wounds, Johnston commanded the Western theater where Parham wrote he hoped to see him strengthen that army out down there and make them do something yet. The remaining sheet(s) of this letter appear to have been lost to time; hence, the reason for the abrupt end. I rcd your welcome letter by George Dooley and hasten to reply as I have an opportunity to send one tomorrow, though I have no news of importance to communicate. Click image to learn about Confederate breastwork construction. We have moved our camp about 5 miles The Brigade is scattered about the River guarding fords and working on breastworks, our company will have to work on them tomorrow, for the first time since we have been in service, but if we have to fight I would rather fight them in breastworks than in the open field. Our Pickets occasionally ou have a skirmish with the Yankee cavalry, but as yet we have had no fight, nor I don’t think we will unless they try to take Richmond by way of Petersburg. I have been listening every day to hear of them fighting at Vicksburg. It is rumored that they Yanks tried to cross the River at Fredericksburg but failed, but it is seldom now that we ever get any papers and can not keep posted. I hope the Yanks will keep out of Lafayette this summer and give you all a chance to make some thing to eat. Do not think hard of me writing no more, for I have nothing that would interest me you- If you have a chance send me a shirt, I have enough of socks and drawers now. Give my love to all the family and tell them to write soon. Do so your self. A History of Company G, Eleventh Mississippi Regiment, C.S.A. documents information about a comrade mentioned in this letter by Parham. George M. Dooley, who delivered the mentioned letter to Parham, enlisted twenty years of age and single. He was present and wounded at Seven Pines. On account of wound and sickness he was with the company no more until the battle of the Wilderness; he was present two days, and again at Tolles Mill, where the record says he was mortally wounded, and died May 26 at Richmond, Va. His wound was through the left shoulder. 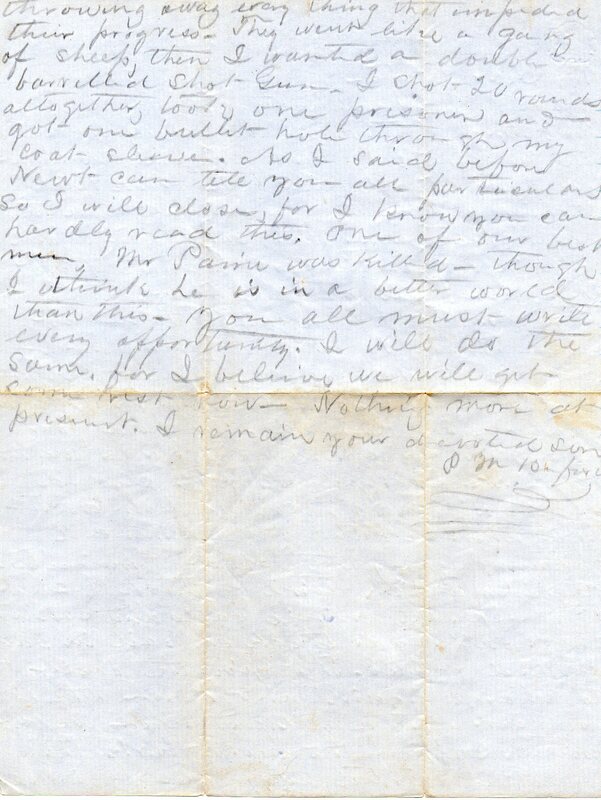 William B. Cullen appears to have delivered this letter to Parham’s family based on information written to his sister on April 1, 1863. Cullen enlisted April 26, 1861, at Oxford, Miss., for one year. Born in Virginia, was a clerk at Oxford, Miss. ; eighteen years of age and single. He was severely wounded at Seven Pines and lost his right arm, and was retired January, 1863. This letter was written, and presumably delivered from camp, months after Seven Pines and Cullen being retired from service; maybe the necessary timeframe for his being fit for travel. We drove the enemy out of two breastworks made of logs and supported by 10 pieces of artillery which we took I mean our Brigade. We had four killed in our company and 10 or 12 wounded. When we charged, we never stopped untill within 30 yards of the first breastwork, where we halted and commenced shooting, being there about 15 minutes during which time I think I shot 15 rounds, the minie ball and canister shot- falling as thick as hail in our devoted ranks. They give the order to charge again and down the hill we went with a yell. and before we got within 20 ft of the breast work the Yankees started, every man for himself throwing away every thing that impeded their progress- They went like a gang of sheep, then I wanted a double barreled Shot-Gun. I shot 20 rounds altogether, took one prisoner and got one bullet hole through my coat sleeve. As I said before Newt can tell you all the particulars so I will close, for I know you can hardly read this. This rushed letter is a brief recap of the previous two already posted. Parham mentioned in the previous letter that his cousin, Newt Shaw, was wounded during the Battle of Gaines’ Mill. Here we see that Newt returns home to recover and hand delivers this letter to Parham’s parents in College Hill, Mississippi. David B. (DB) Paine was during Gaines’s Mill mortally wounded and died at Field Hospital, June 27, 1862…He deserves more than a brief mention when speaking of faithful soldiers. He was most methodical and conscientious in the discharge of every duty called upon to perform, and…that the Confederacy lost a hero who deserves to be held in loving memory in the person of David Brainerd Paine. This 21 year old man left quite an impression on survivors of the Lamar Rifles 40 years later and was held in high regard by Parham in letters. What greater legacy is there for one to leave behind than to be described by comrades as ever faithful in carrying-out duties and Christian?